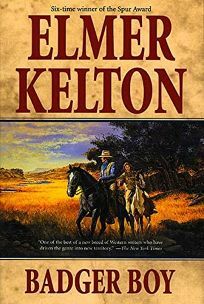 The indefatigable Kelton cranks out yet another rousing western, his ninth novel under the Forge Books brand, with this continuation of the saga of the Texas Rangers and his redheaded hero, Rusty Shannon. In 1865, the Civil War is just about over and the Confederacy is collapsing everywhere. Only small, undermanned ranger companies protect the Texas frontier from marauding bands of Comanche warriors, and army deserters, outlaws and Yankee soldiers add to the troubles of a desperate population. When Rusty leaves the rangers to return to his farm, he finds that his sweetheart has married somebody else. Racial tension between rednecks and freed slaves boils over, and old enemies return to settle scores. Rusty faces a new dilemma when he captures a white youngster, called Badger Boy by the Comanches who had seized him as a baby and raised him. Rusty himself is an orphan once captured by the Comanches. Observing Badger Boy, he begins to understand a great deal about his own past and what it means to his future. Since Rusty's debut in The Buckskin Line (1999), he has grown from a na ve kid into a responsible leader of rangers, a savvy frontiersman who is as tough as a boiled owl and smart as a fox. Running gunfights with Indians, outlaw ambushes and showdowns with horse thieves and renegade murderers liven up this polished and tightly wrapped yarn of duty, honor, courage and gunsmoke. Kelton is a master of both plot and character development, and his Rusty Shannon is a down-to-earth, dusty cowboy whose exploits always thrill Kelton's fans. Regional author tour. (Jan.) Forecast: In his niche, Kelton is the tops. He's been voted the Greatest Western Writer of All Time by the Western Writers of America, and is a six-time winner of the Spur Award. If booksellers emphasize his stature in the field, this standout title could be one of his best-selling yet.